Travel with Kevin and Ruth! : No water! Yesterday was our annual camp beach volleyball tournament. This is a well attended event and the players are pretty serious about it! 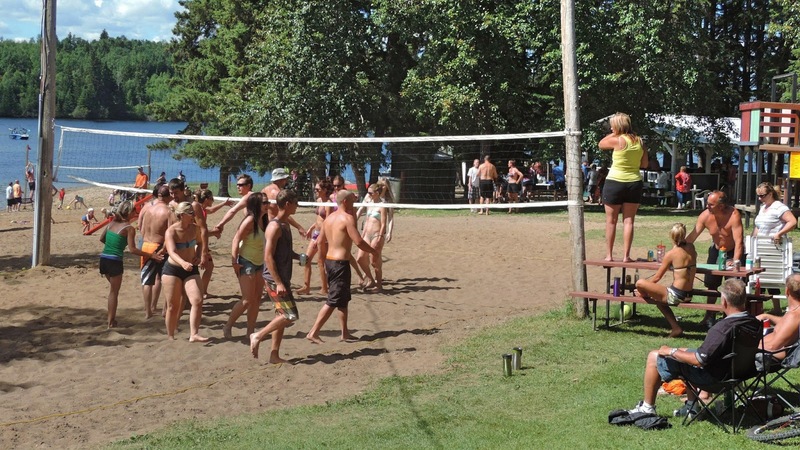 We had 16 teams entered and the two volleyball courts on the beach were going all day. 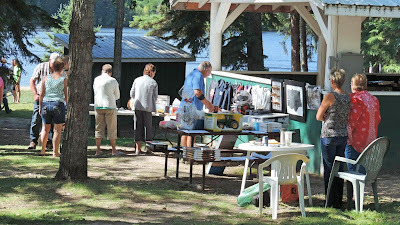 Also had a silent auction with the proceeds going to the campground, and a beach BBQ set up with steak burgers. So with all of that going on, and a pretty much full campground...there were a LOT of people! Don't forget that we also have 80 cabin/cottages on the park property and of course on a beautiful August long weekend everybody was out at the lake. 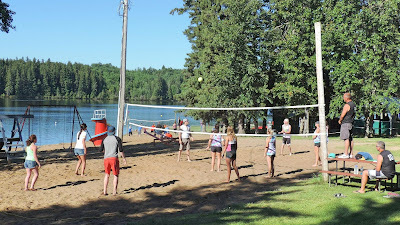 Our beach volleyball tournament started right on time at 9:00am. Our first problem happened just before noon. I had been monitoring the levels of our sewage holding tank and they were getting full. The pumping truck is scheduled to show up Saturday mornings and so when he wasn't here by noon I got on the phone. He said he couldn't get here until 4:00pm or so and I wasn't happy. I called our emergency back up guy, and he was about the same. So I shut off the showers and saved the empty space for flushing the toilets. Beach volleyball still going in the afternoon. Sure enough, it was about 4:00pm when they got pumped out. Amazing how many people want to take showers in the middle of the day, but it's entirely possible they were busy all morning. Of course many people think they have to shower every single day. Couple that with the fact that most of those people think we have unlimited resources like they do in the city. Heck...go jump in the lake...literally! Anyhow, around about that same time Ruth noticed that our fresh water tank was getting low. There's a well pump that supplies a 1,200 gallon fresh water tank. The pump runs until the tank is full. 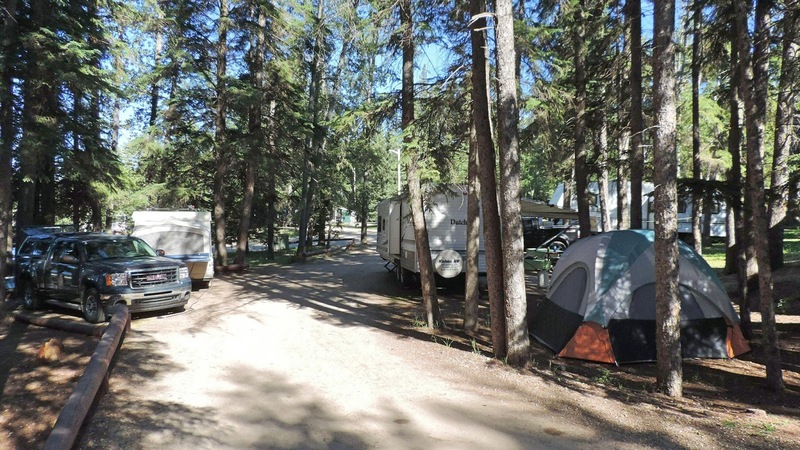 But the campground was using more water than the pump was able to supply and the tank was dangerously low. I guessed we would run out of water before the end of the day, and sure enough that's exactly what happened. Campers packed in everywhere. Even had some tents set up in the day use area! Well, you should hear people panic when there's no water! Of course all we could do was explain to people the problem. Most understood, but then quite a few people have their own toilets in their rigs. The tenters of course still need to use the campground toilets so here it was at close to 10:00pm and I was bringing water up from the lake in buckets to flush the toilets with. Oh well, you do what you have to do. Between dealing with that and checking on noisy party people it was after midnight before we got to bed. I had expected the tank to fill up overnight, but by 6am (yep, I was up at 6:00am!) it was just less than half full. That means that the well itself is starting to get low. So I'm going to have to call a fresh water supply truck to top off our tank and hopefully that will get us through today. The system has a hard time keeping up with this many people and we had noticed it as well on July 1 long weekend, but not to this extent. Checking out the goods for the silent auction. So, we'll see what kind of excitement today brings! There's a horseshoe tournament today, and a big fireworks show on the beach this evening. Guess I'll get to try out the new camera on it's "fireworks" setting! What other new kind of challenge can you run into? You certainly know how to roll with the punches! Hopefully we have seen the last of the challenges, this one was certainly a hard one but I think we managed to get through it without upsetting the campers too much. Well dealt with! You guys are the epitome of "Dealing with it". Looks good on you! Thanks Peter, we go around the campground doing what we have to do with smiles on our faces, good or bad and I think that helps a lot. There were a few campers not happy about not having the showers available but they seemed to understand. It sure was but things could have been worse. Well not totally on top of everything otherwise we would have had extra water on hand but we didn't know that the well wouldn't support this many people in the middle of summer after two weeks with no rain. We will be better prepared now that we know this. It's all a learning curve and we just have to work out the problems as they arise. Running out of water would not be a good thing. Hope you get a fix for when the campground is busy. Luckily is wasn't for too long and we lengthened the time by shutting the showers down so that the toilets could still be used. Definitely more important to have the toilets available then the showers and it was only for part of the day on Saturday and Sunday and first thing this morning. So they did have access to them during part of the day each day. This will be something that Kevin will bring up at the next board meeting and in the meantime we are working slowly on filling the second tank so that we have a backup. Like you said city people do not understand that there is limited water and sewage in campgrounds. We got by at our cottage for the whole summer, and for many years, with a hand pumped well, outhouse and jumping in the lake. Had our family here for one day and filled our gray water tank, (45 gallons) just washing hands and brushing teeth. We also conserve even when we are in a house. We certainly see lots of waste here at the campground and I am sure it is the same at any campground with water, electricity, and garbage. There's sure a lot of food that we see getting thrown out which totally amazes us.